In honor of Veterans Day, we are publishing a guest post by veteran and advocate Dottie Guy. Thank you to Dottie and all of our veterans for your service. This year on Veterans Day, the focus is on a demographic of vets that have long been neglected: women veterans. As a member of the Army National Guard, I went to Iraq in 2003 and prior to that, I was deployed for Homeland Security immediately after the attacks on September 11, 2001. My job was military police and it was an experience that I will never forget. War has changed quite a bit. Women are now on the front lines and we perform duties that we never would be allowed to perform just a short time ago. I always felt that being a woman in the military meant I had to be stronger. I felt the need to hold my own in this boys club. I ran injured, I took a lot of crap from men who didn’t think I would be able to hack it, and I kept quiet about my pain because I didn’t want to come across as weak. I am no longer in the military, but I have carried this mentality with me. I have to deal with a system that is ill-equipped to handle the record numbers of women veterans that are coming home from Iraq, Afghanistan and other conflicts that the military in involved in. The rate of military sexual trauma (MST) for women is disproportionally high (according to the Department of Veterans Affairs, 1 in 5 women responded “yes” when screened for MST) and deeply troublesome…and only a fraction gets reported or treated. We also have to deal with the Post-Traumatic Stress Disorder and other combat-related mental health disorders in unique ways. In talking to mental health specialists, they find that women don’t report this as often because a lot of times, they of the feeling that we often put on a front and internalize our very real issues. The word “crazy” is often thrown around about women in emotional states and I feel that we aren’t taken as seriously. In the midst of a panic attack, I had a psychologist tell me “Imagine what I would be like without medication.” I promptly walked out of her office. There are a lot of other issues that face women and all other vets such as unemployment (it’s currently at 12.1%), suicide (32 veterans attempt suicide daily. 18 succeed), and homelessness. There is a lot to be desired of our treatment of vets. Women vets are coming home to system that is ill equipped to handle them. Fortunately, these issues are being addressed. The VA has a special clinic for women veterans. More people are being made aware of our issues and struggles. There is more work to be done, but this is a push in the right direction. For more information on veteran’s issues (with details on the unique issues that women face), please visit Operation Recovery. Dottie Guy is currently serving on the San Francisco Veterans Affairs Commission. She was in the Army and served in Iraq in 2003. She is passionate about veterans issues; she wants to ensure that they get the treatment and care that they earned. Dottie is also a photographer. She has shown her work in throughout the United States and is a Getty Images contributor. When she isn’t out taking photos or helping veterans, Dottie can be found enjoying fried chicken, Breakfast at Tiffany’s, and Tom Jones. 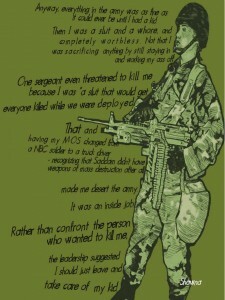 Veterans Day posters via Iraq Veterans Against the War.